On several occasions, I have met with clients who are making up their minds as to which ERP is the most appropriate for their business. In a meeting it is extremely difficult to go into detail and properly communicate the advantages of one ERP over another. Especially because in most situations the client is an expert in their field, but not in management software. Normally these meetings are time-restricted and it is not possible to go into enough depth. I have not found a better way of addressing this question than by writing an article, where the only limitation is how long the reader’s attention can be held. 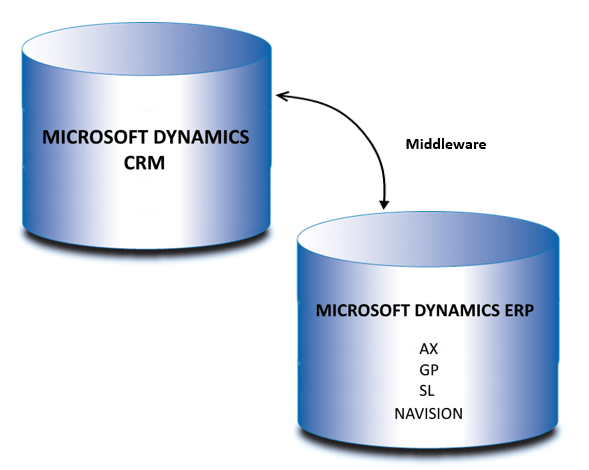 One of the options which clients consider during this stage of decision making is NetSuite versus Microsoft Dynamics. Recently NetSuite’s blog has presented a highly illustrative article on the matter. For those who do not have the time to read it in its entirety, it basically concludes that Microsoft makes a folder of 300,000 clients available to other software providers. Why? 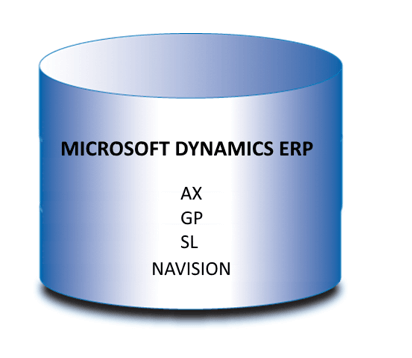 Dynamics GP, SL, Nav, AX, and Business Edition are no longer updated and are moving onto Dynamics 365. The trouble is that what they call migration involves the investment of IT resources and time of up to 24 weeks, as the brand itself states. I am going to attempt to create an exhaustive comparison, focusing on key points. Normally companies which set forth towards digitalisation already have a CRM, or are preparing to install one. 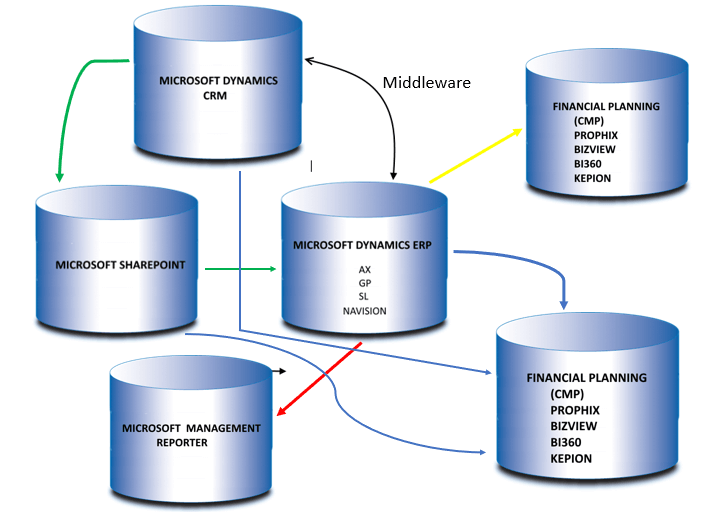 With Microsoft Dynamics, they need some sort of connector, or middleware, which will allow for bidirectional and logical data transfer between both sides. There are many platforms such as Cyclr, Boomi, Jitterbit which can connect your ERP with your CRM. 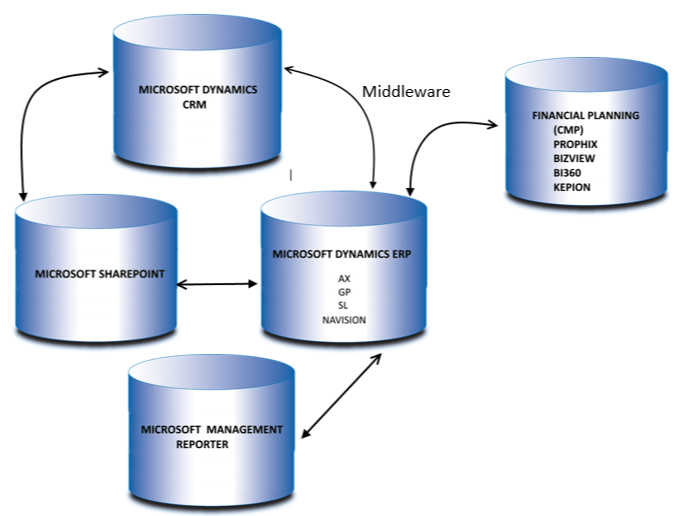 If we also want a secure place where we might store, organize, and share information from any device, which any authorised user can access, it is necessary to make use of Microsoft Sharepoint and connect it to the ERP and the CRM. Let’s suppose that, logically, the company needs to produce financial reports. 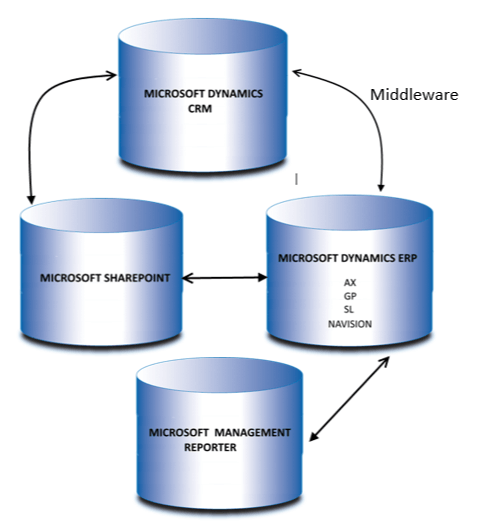 For this, they need to install the Management Reporter, which once again, we need to connect to the ERP to extract the information. Do you see what I’m getting at? 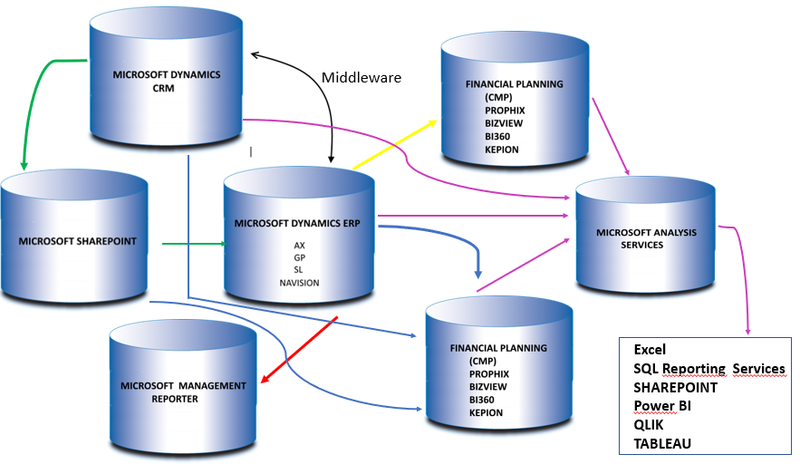 None of the software which Microsoft offers includes a budgeting or forecast tool, therefore we need to use a third party to complete the financial planning task (CPM). Once again we have several examples on the market, such as Prophix, Bizview, bi360, kepion. Besides acquiring the solution, we need to invest time and resources into personalising them so as to integrate them with the ERP. Finally, it is possible that you will need some sort of program that is very specific to your trade, for example, AutoCad in the case of a company involving design, or Microsoft Line of Business, and these will need to be integrated with the ERP, the CRM, and maybe even the Sharepoint. Besides that, it is likely that during the day to day business operations you need to use tools such as Excel, SQL reporting, tools for working on databases for reading and/or writing tasks, some tool or another for legal forms etc. Employees might be satisfied with the solution because in most cases they will use one or two tools at the very most. Another matter entirely is the IT department which, if the company does not have one already, will need to be outsourced. Are you seeing how many zeroes are being added to the final cost? But information is still missing, executives who want to establish global trade or acquire another program will have to make use of data matrices for analysis tasks. No problem. Microsoft also offers a tool for this: MS SQL Analysis Services, which extracts data from all systems, translates it, normalizes it, and stores it in its SQL Server Integration Services (SSIS), to later be presented in Excel, SQL Server Reporting Services, Sharepoint, Power BI, qlik, tableau, etc. As you can see in this last image, the functional design of the solution is complex, with a licensing cost in every application. Now, what happens when we need to update any of our systems? 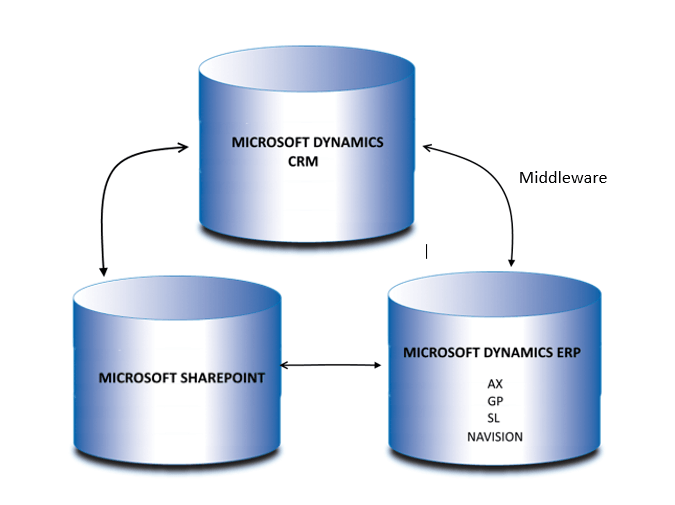 Remember that, as stated in the article we saw earlier, Microsoft has advised its customers to migrate onto Dynamics 365, as the rest of its ERP will no longer be updated. But let’s suppose that the update can be made and we want to carry it out. The cost of the update is almost as much as that of a whole new project. Now, have you considered that on top of all that you must guarantee the security and inviolability of your systems? And what will that cost? 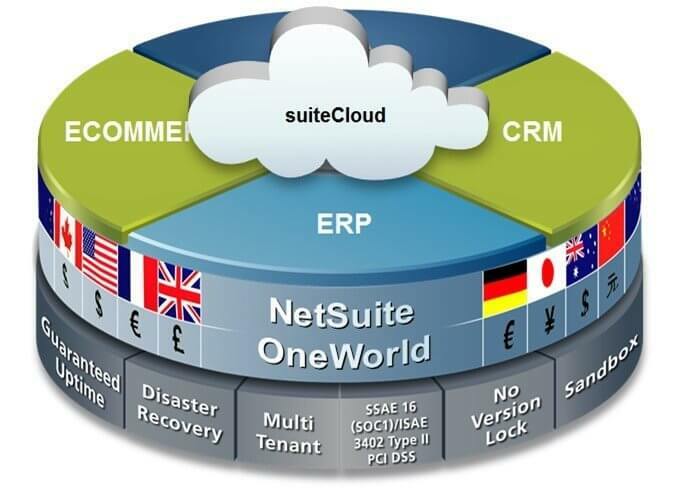 What solution does NetSuite propose? NetSuite is cloud-based and therefore does not require server or software maintenance. The cost of licences includes two annual updates that do not involve having to personalize the system again as they respect your company’s personal configurations. By using one database and being cloud-based, all users have real-time access to the same information. NetSuite has access to the most rigorous security certificates on the market, as well as strict 24/7 security measures, so that in the unlikely case of a breach, it will be detected immediately. If you want to know more about operational security, this information is here and if you want to know something about app safety you can find it here. Backup copies are made every night so you will not lose information. And you only need to worry about one system and one supplier. I would love to hear about your experiences with Dynamics, NetSuite, or other systems you have implemented and used. What advantages does your system provide you? Have you ever had to tackle the challenge of app migration? Did you receive correspondence from Microsoft inviting you to migrate onto Dynamics 365? Have they budgeted how much this migration will cost you? Before making your choice, analyse and compare other systems, as the time and effort involved are minimal, not to mention the cost. If you want a personalized budget, our assessment team would be glad to make you a no-obligation quote.